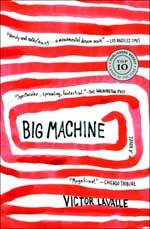 "These are the opening elements of Victor Lavalle's new novel, Big Machine. The protagonist has a problem, but what's a man got to worry about if he's mopping floors for Trailways in Utica, New York? Guest host Jacki Lyden talks to LaValle, who some say writes like Thomas Pynchon, others like Ralph Ellison."